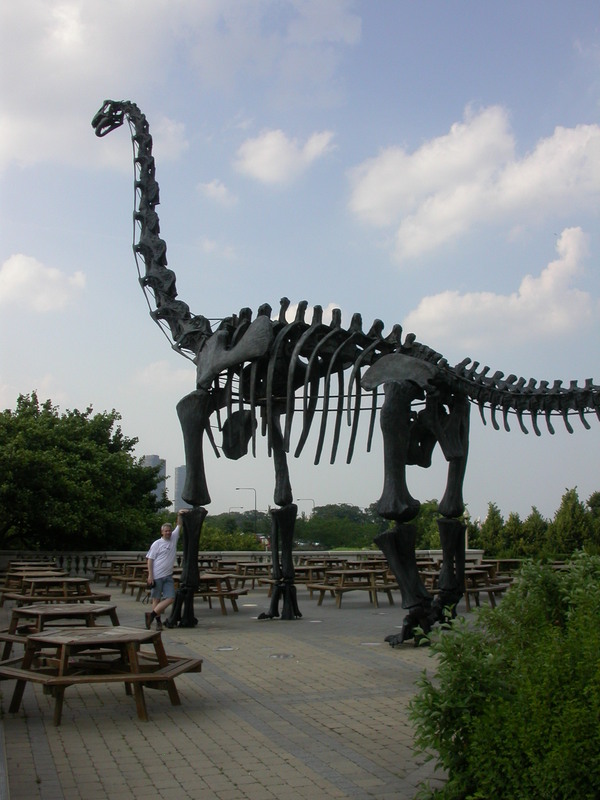 How big was Brachiosaurus‘s forelimb? 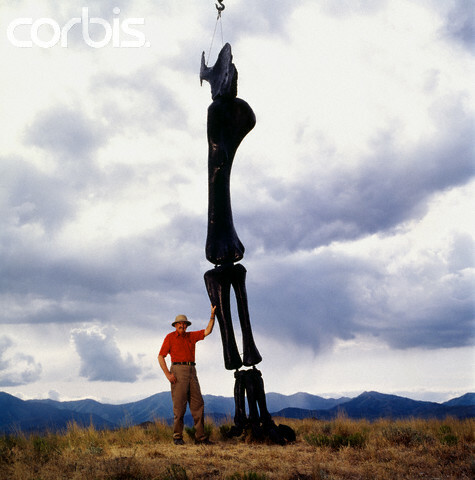 I recently happened upon a picture of the late Jim Jenson standing beside the huge front leg of “Ultrasauros”, which leads me to ask a few questions. Did he really find a complete forelimb? Was the leg from Brachiosaurus altithorax? If that leg is valid at actual size how tall/long was the whole animal? It looks to be about 40% to 50% taller than the berlin Giraffatitan, I am guessing the leg is a constructed representation of how the leg would look rather than a cast of the actual leg because if the whole front leg was found they would probably be the most talked about sauropod bones in the world and the fact is I’ve heard pretty much nothing about these remains for years. I answered this in a followup comment, but because the answer involved a few nice images, I thought it ought to be promoted into a post of its own. So here it is, in expanded form. I believe I know the picture Peter was talking about: it was either the one on the right, of Jensen working on the limb in the lab, or the one below of the same limb, again with Jensen, this time out in the desert. As an aside: based on a post by ReBecca Hunt-Foster (scroll down to the 12th picture), it looks like this forelimb may have ended up in the New Mexico Museum of Natural History and Stuff (NMMNHS). Anyway, the bad news is that, no, this is not a complete forelimb fossil. The worse news is that the limb is not even partly cast from real material: it’s a pure sculpture, based presumably on the forelimb of Giraffatitan brancai, but scaled up according to Jensen’s idea of how big “Ultrasauros” was. The only part of the model that probably was cast from real material is not part of the limb proper, but the scapulocoracoid — which is the only real brachiosaur element that Jensen found and described from the Dry Mesa quarry. In fact, the scap in these photos (and in ReBecca’s) does look very much like BYU 9462, the element that Jensen meant to designate as the “Ultrasauros” holotype, but didn’t, instead plumping for … ah, you all know the story. 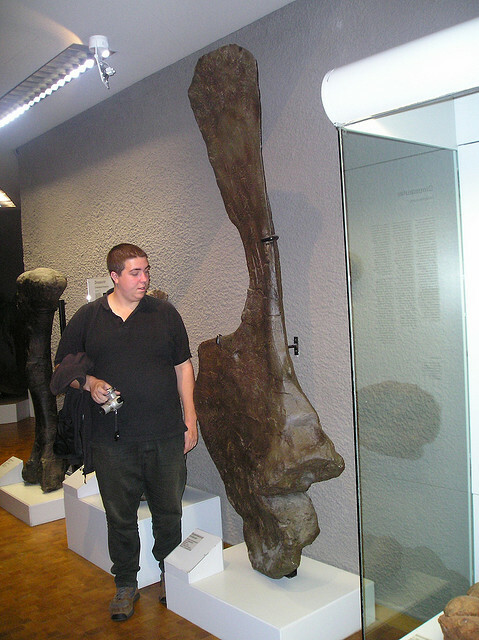 "Ultrasauros" scapulocoracoid BYU 9462 (almost certainly a cast), with Graeme Elliott for scale. My rule of thumb, based on a lot of posing for photos around the Chicago mount, is that if I stand next to the forelimb and reach up, I can just rest my hand on the top of the ulna without stretching. I’m about six feet tall, if that helps. Jim Jensen was 4% taller than me — 6’3″. Bearing that in mind, and looking at the second photograph above (the first one is useless because of the forced perspective), Jensen’s inability to reach close to the top of the ulna suggests that his model is inflated by maybe 30%. Which means that it represents an animal about 1.3^3 = 2.2 times as voluminous and heavy as it should be. 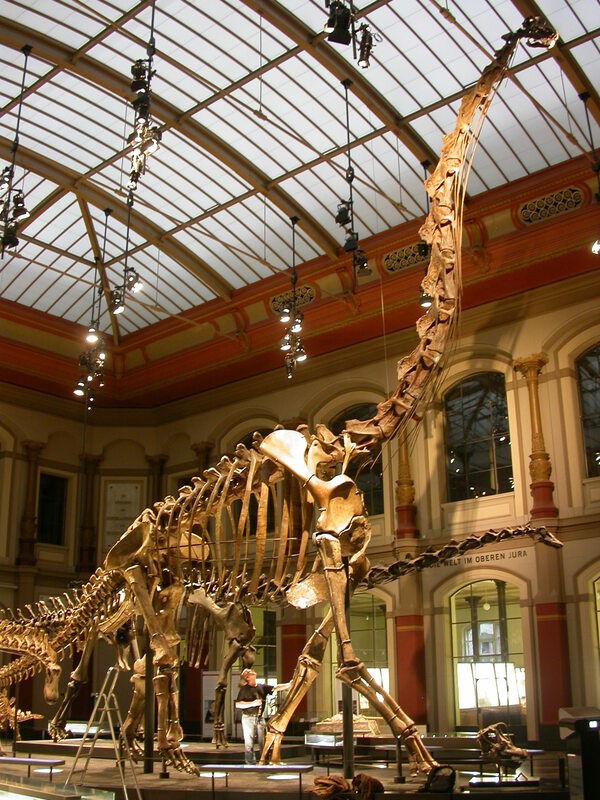 But let’s not forget that among the Giraffatitan material in Berlin is the isolated fibula XV 2, which at 134 cm in length is 12.6% longer than the 119 cm tibia of S II. So that is from animal about half way between S II and Jensen’s Imaginary Monster in size. So. 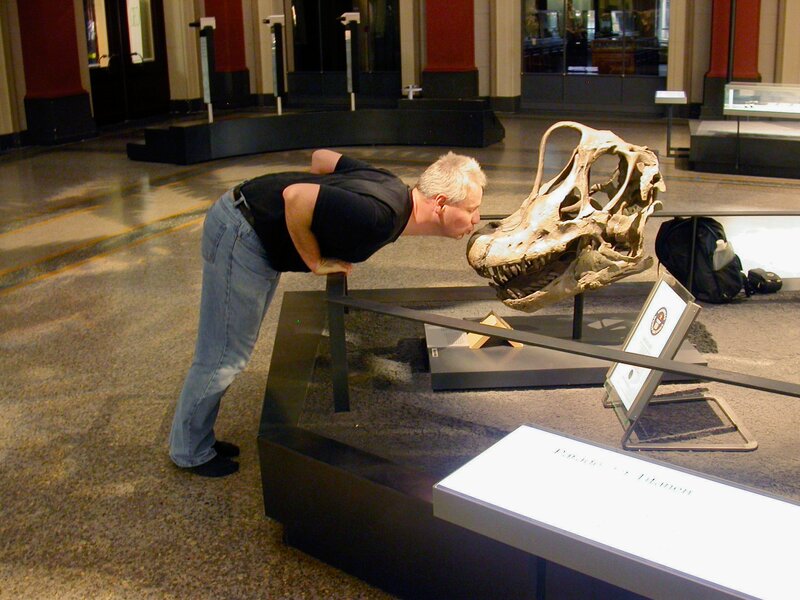 Real brachiosaurs are awesome enough.